Many retailers have relied on outdated legacy planning systems and practices that can’t support the complex planning requirements of today’s omni-channel environment. According to a new special report from Boston Retail Partners (BRP), retailers are finding that many of their current planning applications are ineffective and unable to support the complex analysis required to optimize planning decisions and ultimately, meet the demands of today’s customer. In addition to replacing out-of-date planning applications, many retailers are focused on improving analytics by using science and advanced algorithms to help predict demand and enable smarter merchandise buying and planning decisions. 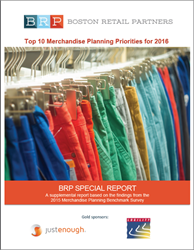 According to the BRP SPECIAL REPORT: Top 10 Merchandise Planning Priorities for 2016, improving analytics is retailers’ top planning priority. This report, based on the recent BRP Merchandise Planning Survey of retail executives, highlights retailers’ top priorities and identifies how retailers are adapting their planning approaches and tools to effectively manage merchandise in an omni-channel world. With the advent of real-time business intelligence (RTBI) across the enterprise, retailers have access to product and customer intelligence whenever and wherever it is needed – creating the opportunity to enhance the planning process. With 58% of retailers indicating analytics as their top planning priority, savvy retailers realize the value of advanced analytics to tap into RTBI and use science to make better planning decisions in real-time. This list of top ten planning priorities for 2016 can serve as a benchmark comparison to retailers’ current capabilities and a checklist of additional competencies needed to improve their planning effectiveness. The result of this comparison can form the basis for identification of what functionality should be on retailers’ technology roadmap as they move towards omni-channel retail. To download the complete BRP SPECIAL REPORT: Top 10 Planning Priorites for 2016, visit: https://bostonretailpartners.com/2016-special-report-merchandise-planning-priorities. The Special Report sponsors are JustEnough and Logility.